Mega-chomp! Stink wants to make the find of the century. He’s on a dig, dig, digging quest in his backyard to find a tooth from a saber-toothed cat, otherwise known as a Smilodon. Why not? Two kids in Michigan found a mastodon bone in a backyard stream, and a girl in Great Britain found a pterosaur bone. It could happen! But Judy thinks the chances of finding a saber-toothed anything in the Moody backyard are one in a gazillion million. 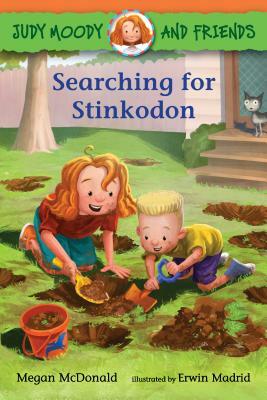 Will Stink make a discovery before their whole backyard caves in? Just right for newly independent readers, this latest story from Megan McDonald is sure to leave Moody fans with smiles as wide as a Smilodon’s. Megan McDonald is the author of the popular Judy Moody and Stink series for older readers. She has also written many other books for children, including two books for beginning readers: Ant and Honey Bee: A Pair of Friends at Halloween and Ant and Honey Bee: A Pair of Friends in Winter. She lives in California. Erwin Madrid has worked as a visual development artist for the Shrek franchise and Madagascar: Escape 2 Africaas well as creating conceptual art for video games. He is also the illustrator of The Scary Places Map Book by B. G. Hennessy. Erwin Madrid lives in California.